Genuine OEM Xerox Drum Unit, 30,000 page yield. Xerox part number: 101R00555. 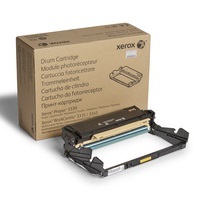 Drum Unit compatible with Xerox Phaser 3330, 3335, 3345. Genuine OEM Xerox Toner Cartridge, Black, 2,600 page yield. Xerox part number: 106R03620. Laser Toner Cartridge compatible with Xerox Phaser 3330, 3335, 3345. Genuine OEM Xerox Toner Cartridge, Black, High Capacity 8,500 page yield. Xerox part number: 106R03622. Laser Toner Cartridge compatible with Xerox Phaser 3330, 3335, 3345. Genuine OEM Xerox Toner Cartridge, Black, Extra High Capacity 15,000 page yield. Xerox part number: 106R03624. Laser Toner Cartridge compatible with Xerox Phaser 3330, 3335, 3345.